This quick fold and store concept will provide every eating establishment with the ability to set up and tear down very quickly, thus saving valuable time and space. 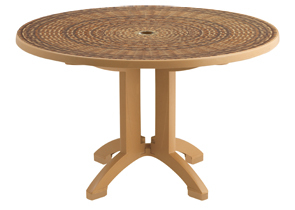 The table top and base are shipped as a set. The chairs are packed 4 per carton. 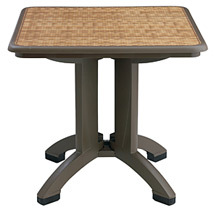 This quick fold table set features a 1-1/2" umbrella hole, a reinforced table top and a Y-leg base shown below, for maximum stability. All quick fold tabletops, bases and chairs are constructed from resin. 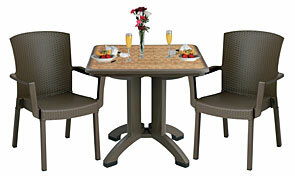 The resin tops, bases and chairs come in the styles and colors shown. The chairs are rated to 300 pounds and tested in compliance with ASTM F1561-96 Class B requirements for safe commercial use. These classic Havana chairs and armchairs replicate the look of quality wicker textures without the maintenance and at a fraction of the cost. They feature comfortable, easy to clean seat shells which will not break nor powder in the hot sun. The texture will not harbor germ, sand dirt, bacteria nor fungi. 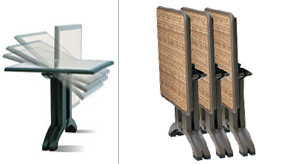 Powder-Coated aluminum legs add the structural strength to these ASTM rated commercial chairs. Havana chairs and armchairs also stack for easy storage. Fold for Easy Storage and Transport!